Ladies and gentlemen, take your seats. The Fruitchouli match is ready to begin. On the right we have peach and apricot in their full jammy splendor. On the left is patchouli, with an assist from amber. With power players like this, who will win? And will anyone be able to sit through the entire competition without a clothespin for her nose? Andy Tauer had the guts to make fruitchouli his own by creating Tauerville Fruitchouli Flash. Fruitchouli Flash has notes of peach, natural apricot extract, rose, white flowers, natural patchouli and fruity musk. It smells little like Euphoria or its many wannabes. Instead, it’s a simple and noble, if bohemian, combination of classics. Fruitchouli Flash doesn’t have the usual high-register tootling of aldehydes or tingly citrus on application. Instead, the fragrance shoots straight to its main business: peach/apricot and patchouli. The peach and apricot might as well be sitting on your counter, a bit overripe, fruity but not overly sugary. The patchouli is woody and herbal and doesn’t smell like the rancid patchouli I smell all too often smell on strangers on the street. Any rose and white flowers are trampled in the fruit and patchouli head-to-head. Tauer’s list of Fruitchouli Flash’s notes includes musk, but I don’t smell anything soapy or particularly animalic. Amber’s shimmer definitely plays a role, though, especially as the fragrance dies down. But what strikes me most in Fruitchouli Flash is how herbal the intersection of peach and patchouli is. To me, it almost smells like dried marjarom. My garden is just greening the soil, and this afternoon I managed to find a few leaves of marjoram that overwintered, so I crushed them to sniff. To me, add some wood and it was almost an amped-up take on Fruitchouli Flash’s heart. With Fruitchouli Flash’s combination of fruit and patchouli, I was afraid I’d be wafting intrusive sillage for hours, but that wasn’t the case. Although the fragrance lasts from breakfast to dinner, after the first half hour, it’s quiet. Toward the end of its life, the fruit and herbal hit fade to a gentle woody amber. Fruitchouli Flash is no skin scent. It has a definite, straightforward, and particular signature, but it’s fun. This fruitchouli says what it is in a down-to-earth way without the synthetic “neon orchid” heart, sugar, screechy opening notes, and advertising campaign featuring nightclubs and silicon-enhanced lips. Bonus: it’s affordable. Nice work, Andy. Now let’s see what you can do with Skankfest and Big White Floral. 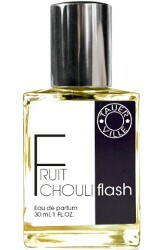 Tauerville Fruitchouli Flash is $63 for 30 ml. For information on where to buy it, see Tauer Perfumes under Perfume Houses. 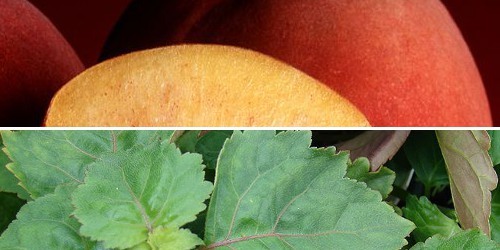 Note: top images are Autumn Red peaches and Pogostemon cablin (leaves) [both cropped] via Wikimedia Commons. I think it was Denyse who coined Fruitichouli but Robin mentioned perhaps the clever people at Perfume Posse did. Hopefully they all show up! This doesn’t speak to me much, honestly. Fruit chypre? Yes! Patchouli? Yes! Together…. I’d have to be convinced. I had the feeling Fruitchouli Flash is supposed to be more of a fun than serious fragrance. But, if you like patchouli, you really should give it a try! It was Melissa Anderson. I just verified it with her. For some reason, I’ve thus far been unable to enjoy peach in fragrance, despite my love for the real thing. The last one I didn’t care for (but thought might turn me) was Shangri-La. Reminded me of potpourri, and patch isn’t even listed as a note. Would also love to experience interpretations of Skankfest and BWF. Do you like YSL Yvresse/Champagne? I love the apricot note in it, but, that said, I know what you mean about the perils of peach. Have you tried Flower of Immortality? Also, I love the peach in Visa, but it doesn’t have many fans here on NST. ???? It’s been ages since I smelled Visa! I’m going to look for my sample. It’s a fun fragrance! Plus, it won’t break the bank, which is a real plus. I’d take this fruitchouli over any of the others I’ve smelled. How is the Rose Flash? I haven’t smelled any of the other Flashes yet, unfortunately. You’re robbing yourself. Rose Flash is amazing. I think it’s my favorite new find of the last year. It’s an intense, fun, beautiful look at rose. I haven’t tried many Taeurs but if this is what Andy is about, that guy is putting the old guards of the perfume world on their toes. And it’s rich and lasts overnight! You’ve gotta try it. It smells a lot like Lush Rose Jam shower gel. Yum! You guys have convinced me! I’ll track some down. So who ended up winning the fight match team jammy or team patchouli? Jammy took it for the first half, but patch had the last word. I definitely want to try it now after reading your take on it. I like his signature line but haven’t lived any of the Flashes enough to want to own any. This one definitely sounds interesting! It’s so purely what it advertises, that if it sounds intriguing at all, it’s worth a try. I always gave Robin credit for “fruitchouli,” since I read it here first. Robin doesn’t think it was her, though. Whoever coined the turn should speak up with pride! It was mbanderson, commenting over at the Posse. Do you mean my beloved scent cousin Melissa Anderson? Yes! In late 2009, IIRC. We have it documented now! Thank you! Let it be noted for posterity. Hee hee, late to the party, this is so amusing! It really is a great descriptor! I just sprayed this on and it’s lovely. Nothing like the other heinous fruitchoulis I have smelled (La Vie est Belle, I am looking at you.) I am getting a lovely peachy apricot smell (very subtle and refined) over a clean woody patchouli (also subtle and not musty). It’s very nice. Try it without fear! Piping up here. Yes, I was the one who first coined it. Disparagingly, as Angela noted. But I will gladly try Andy’s version! It was so funny to see it on a bottle. Angela, this is on Elena Vosnaki’s Perfume Shrine, not the Posse. Yes! Of course you’re right! I was clearly working without enough coffee this morning. Thank you SO MUCH for point that out. I can hardly wait to order this. Apricot/patchouli – my kind of fragrance. I have Rose, Incense and Amber Flash – all are beautiful and long lasting. People stop and ask me what I’m wearing. For those who don’t like “fruity” smells. I used to wear L’Ombre Blue many years ago before the evil reformulation wizards had their way with it. It originally had the most beautiful mango base that wrapped you in a cloud of fruit magic all day long. I ordered a bottle through a discounter and it is such a sad travesty of the original fragrance I could cry. So Andy saves the day for fruity fragrances! I’m glad you’re excited for this! I hope it’s everything you want and more. This seems like a missed opportunity to call a fragrance “Peachouli”. I’d buy that.